I very much doubt anyone has ever said you can’t visit Italy without visiting Bologna but what a shame that is, because wouldn’t you know, it wound up being the clear highlight of our time in the country and handily ran away with our hearts. Tucked away in the Emilia-Romagna region, Bologna tends to fly under the radar of most visitors as they skip over it en route between Tuscany’s heavy hitters and the bustling hive of tourism that is Venice. Truthfully, if not for Bologna acting as the cheapest departure point to our next destination on our whirlwind western European tour, we likely wouldn’t have stopped by for a visit either. Sure I had heard the city was an epicure’s delight, but I assumed all of Italy would be a feasting free-for-all and wouldn’t require a dedicated destination on that front. As it turns out, I was wrong about the food situation in Italy, and had we skipped Bologna, that would have been a terrible error as well. Of course, many people tried to tell us we were fools for our choice. When we told folks that our final stop would be Bologna, they kept asking us why we didn’t just go to Venice instead. On a bad day, I’d imagine I could give you several thousand reasons (in the form of tourist bodies) to visit Bologna instead… I’m sure Venice has its charms, but as we learned all too well in Florence, popular Italian cities in peak season are no trifling thing, and if there’s anything that can detract from them, it’s the suffocating presence of other people. (See Sartre’s infamous words, “Hell is other people.”) To be completely honest, after the claustrophobic crush of crowds, the notion of going some place most other people do not was really appealing to us. And, of course, the cheap plane tickets out didn’t hurt either. So it was that we arrived in Bologna, knowing little more about it than that it had a possibly slamming food scene, is home to the western world’s oldest university, features some interesting Renaissance-era architecture, and that hardly anyone bothers to visit. We had no list of restaurants to eat at or sights we needed to see or things we needed to do. We came ready to discover on the ground what Bologna held for us, ready for it to surprise us. After nearly a month of struggling to find our feet in Europe, it felt like we were finally getting into our travel groove once again. Maybe we were feeling slightly ground down by our experiences in Florence and Rome (and Paris before them), but it felt so good to arrive in Bologna without any expectations—for the city or for ourselves. Undoubtedly the smartest decision we made regarding our time in Bologna is that we chose to CouchSurf once more. We realized we had been feeling kind of disconnected from the places we were visiting, and managed to secure a room on the outskirts of town with a lovely man named Enrico. I am confident that we would have found Bologna charming and delightful had we been there totally alone but, without question, hooking up with Enrico was the best thing we could have done. I cannot say enough about his incredible kindness and generosity; as you will see, his hospitality really made our trip to Bologna. One of the things we love best about CouchSurfing is the instant connection we get to the places we visit and the insider’s knowledge that we get to benefit from. Time and again we have found that the best of a destination is revealed to us when we have a local by our side and their eyes and experience with which to view it. Take for instance our first outing in Bologna. In a stroke of poor timing, our first day in the city fell on a Saturday when most businesses and attractions throughout the city are closed. To add insult to injury, the sky was an ominous grey and promised rain. Unwilling to be deterred, and on Enrico’s suggestion, we agreed to take part in a common weekend ritual amongst locals and climb our way up to Saint Luke’s Basilica (Santuario della Madonna di San Luca). Without Enrico’s enthusiasm and urgings, we certainly wouldn’t have tackled this bracing (invigorating?) hike; for one, we never would have known about it, and for two… well, we all know that climbing up things is rarely my favorite thing to do. Despite the threatening skies, the majority of our walk was risk-free as we were able to make use of the city’s famous porticos (covered walkways). Numbering 666 and considered one of the city’s hallmarks, these protected pathways allow for a completely sheltered 3.5km walk up the rather steep hill upon which Saint Luke’s is perched. (And it should be noted that the San Luca walk is only a fraction of the arcades that crisscross the city, covering 40 km of ground in total!) 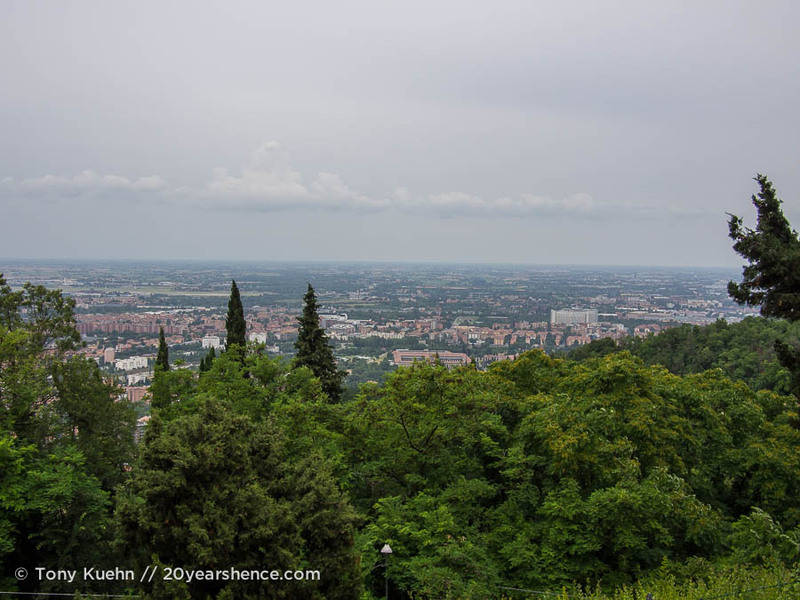 We were huffing and puffing when we reached the top—even with ample “photography” breaks—but we had a magnificent panorama of the city to reward us (and gelato on the bottom when we made our way back down!). In a monumental act of generosity, Enrico took the following day off from work so that he could play tour guide and show us around his city, even as the skies opened up and spat down rain. He ticked off all the city’s most important and impressive sites, including its own leaning towers (Torre degli Asinelli and Torre dei Garisenda), its famed university (the oldest in this hemisphere! 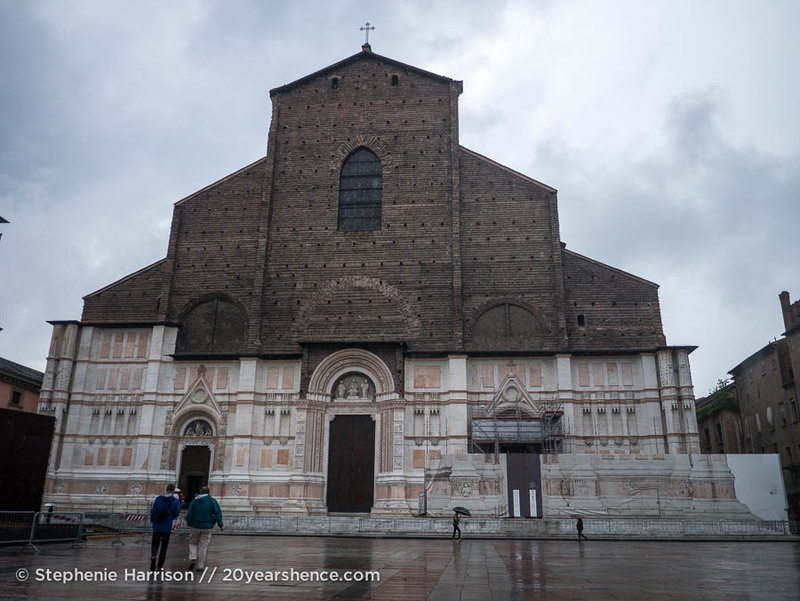 ), its massive San Petronio Basilica, the awe-inspiring Santo Stefano (which contains SEVEN religious complexes within it, some dating back to the 5th century! ), and the old Jewish ghetto (now a haven to trendy students). Some of the interior of Bologna’s university — founded in 1088 — and the oldest lecture hall in the western hemisphere. It was customary that when a student matriculated their family crest was inscribed on the walls or ceiling of the university. The half-finished facade of the San Petronio Basilica, ironically under construction. The mind-boggling complex that is Santo Stefano. 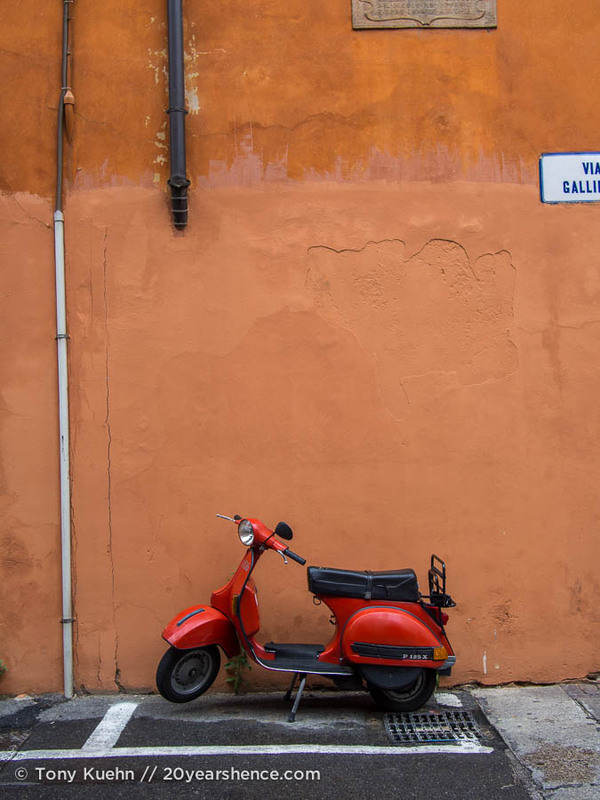 Known for its rust red brickwork and impeccably preserved medieval architecture, wandering around Bologna would be a treat even if one were completely ignorant about the history and significance of what was on display. After all, you only need eyes to see that Bologna is a gloriously pretty little city. But having someone who was not just knowledgeable but also passionate about the city and could make our tour personal made our time there even more special. As Enrico shepherded us around the city, he didn’t just tell us the dry facts you could learn anywhere, he shared some of the city’s more intimate secrets and scandals with us as well. When we toured Palazzo Comunale (Bologna’s City Hall), Enrico showed us the room where he had been married and when we stepped outside and gazed up at San Petronio Basilica, he confided that the rather banal top portion of the building was due to concerns on the part of the Pope back in the 16th century who feared San Petronio would outshine Saint Peter’s of the Vatican and put a stop to the construction. When we stepped out into the Piazza del Nettuno where a gigantic statute of Neptune stands at the center, he regaled us with tales of how its sculptor composed it so that from one corner of the piazza—where a convent used to stand—it appears as though Neptune’s hand is actually a massive erection. When he took us to the covered arcade north of the Piazza Maggiore, he showed us how a whispering gallery has arisen from the architecture, and seemed just as delighted as we were as we gleefully shared secrets loud and clear with one another despite our hushed voices. I think that if I had to pick a favorite part of the city that we saw that day, I would probably have to pick the Quadrilatero district. Previously one of the poorest parts of the city, this area is a gastronome’s delight, housing wonderful fresh markets and specialty food shops. It’s a feast for the senses and a photographer’s paradise; even if most of the stalls were rather out of our price range, it was still absolutely wonderful to watch the locals shop for their fruits and veggies and uncover some of the more obscure local delicacies (care to take a visit to the horse butcher for all your equine meat needs?). As I mentioned earlier, Bologna is known to be something of a foodie haven and is the birthplace of some of Italy’s most iconic dishes. 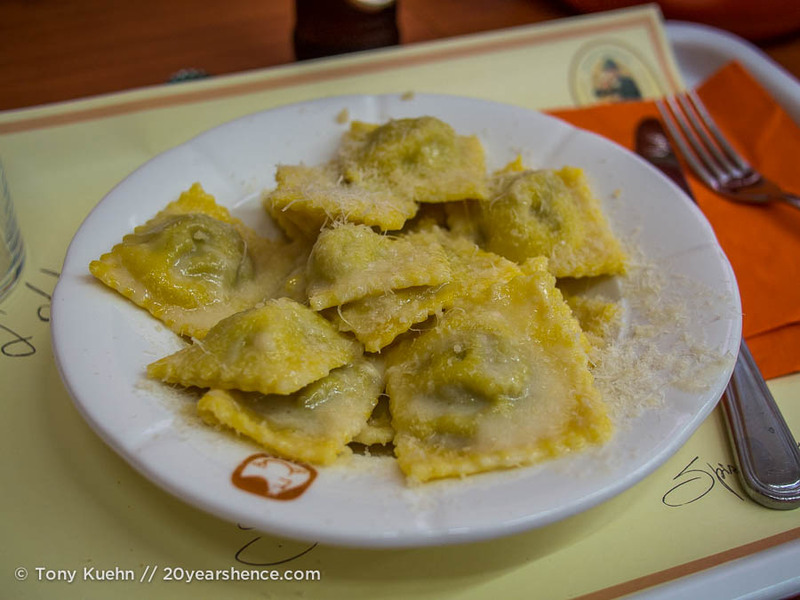 In particular, I knew that I would have to try some authentic tortellini while we were in town, not a hard thing to do as the town is (rightly) proud of these delightful little bundles whose distinctive shape was inspired by Venus’s bellybutton. Unlike the tortellini that you find in North America, which can be stuffed with anything from ground beef to pure cheese, tortellini filling in Bologna is closely controlled: in order to be marketed as tortellini, a certain proportion of the stuffing must be made up of local ham and meat. And rather than being served with a thick sauce, traditionally the pasta is served in a light broth. 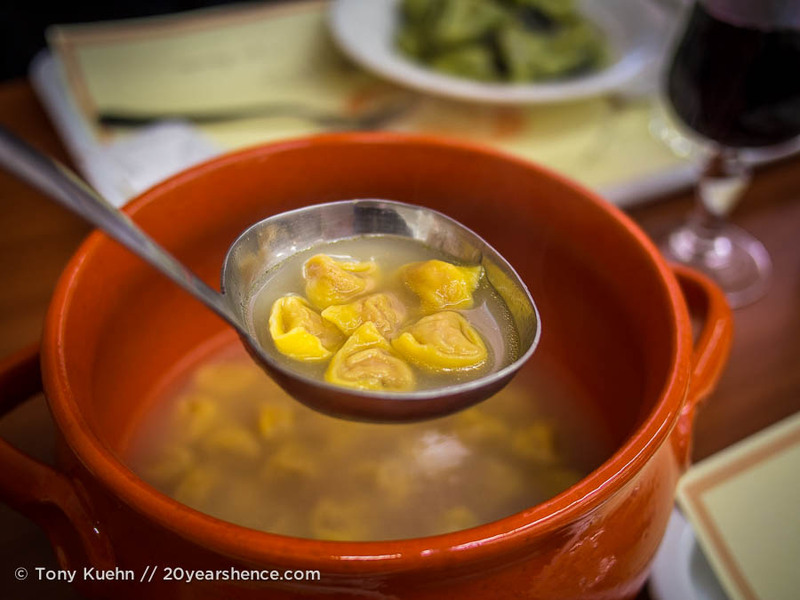 Rather than the insipid, doughy carb bombs that I am accustomed to, the tortellini here were chewy yet tender and absolutely packed with flavor—the ham was pungent and paired wonderfully with the broth. I reckon that I am ruined for all other tortellini for life! As good as our meal out with Enrico was, however, anyone who has had the pleasure of being invited into the kitchen of a local knows that Italy’s reputation as a great food nation has surely been built upon the skill and passion of its home cooks. 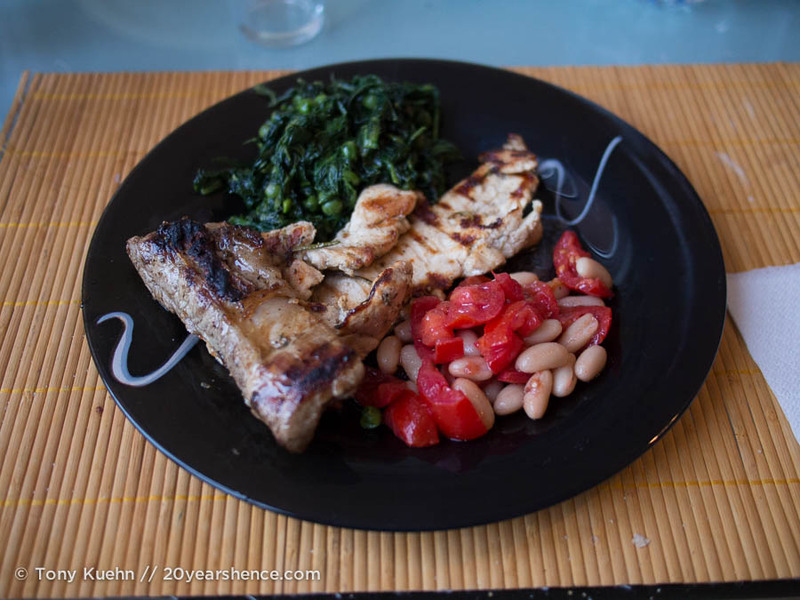 I am not exaggerating when I say that we feasted like royalty when Enrico stepped into the kitchen at home, plating up grilled meats and lovingly prepared veggie sides that only emphasized how lackluster their Tuscan counterparts we had sampled truly were. 1) In Bologna, this kind of sauce is known simply as “ragu”. 2) Ragu is pretty much never eaten with spaghetti in Italy. I like to think I make a fairly mean meat sauce, but Elisa’s sauce really was something other. It took about three hours to prepare (most of that devoted to simply letting the sauce simmer and reduce) and the end product was ridiculously rich and thick and really decadent. This is the dish that exemplifies the Italian mastery of strong, simple flavors and for me, eating this was akin to a light bulb illuminating above my head as I finally understood what all those people with Italian grandparents fuss about when they go into paroxysms of ecstasy over their Nana’s cooking. Like all the best cuisines, Italian cooking done right is all about putting a little bit of yourself, a little bit of your soul into the pot, and that’s just not something you can easily find on a menu. I know a sauce as good as this will never be found in any restaurant, and the memory of making it alongside Elisa is one of my very favorite memories from our entire trip. A cooking adventure to the extreme, because I don’t speak Italian and Elisa doesn’t speak much English, we resorted to speaking to each other in French… but really, I tend to think it was our shared love of food that really allowed us to bond and made for such a great afternoon in the kitchen. Finishing our meals off with some of the best gelato in the city, and we all went to bed extremely happy that night! Despite a shakey middle portion of the Italian leg of our journey, I feel safe in saying we nailed the landing in Bologna. For us, it was a return to form, and a good reminder of how we like to travel and why we find all this globetrotting so rewarding. Though Bologna doesn’t get nearly as much press as it should, all the praise that it does get is very much deserved. Even with poor weather, we enjoyed our stay there immensely, for the legitimate deliciousness of the cuisine, the beauty of the buildings, but most of all, for its people. 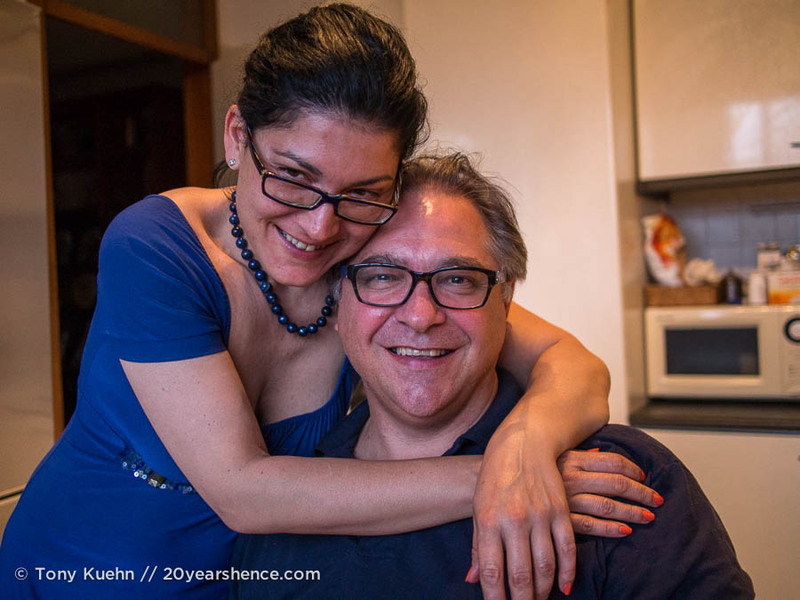 Much thanks and love to Enrico & Elisa for making our stay there so phenomenal: When we think back with fondness for Bologna, I know that most of our affection is focused predominantly on the two of you. Now it’s your turn: Have you ever been to Bologna? If so, what did you think? If not, would you be interested in going? And for all you Italy experts out there, what’s your favorite “non-touristy” town that we should make sure we visit next time? Yes, it was a lot more like dumplings than other tortellini I’ve had before, both in terms of the filling and the quality of the pasta itself. I was a wee bit dubious of serving it with broth (it sounded so boring! ), but it really works! Oh my goodness, after reading this I just can’t stop imagining how good that homemade “ragu” must have been. Getting to cook with an Italian would have been my highlight too! I’m really happy to read such a good review of Bologna – I’m going there this winter, though after booking it I fear that two days might not be enough time. I’m definitely going to bookmark this post for ideas on what to do. And I can’t wait to try that tortellini. I had no idea they were served in a broth like that – so interesting! Yup. I know I groused a lot about how unimpressed we were by Italian food, but Bologna was definitely the destination that forced us to eat our words. I definitely believe that getting to step into the kitchen with the locals is really the best way to enjoy this country’s cuisine (and is possible even for those of us travelers who aren’t being hosted by fancy tourism boards!). I’m so excited that you’ll be visiting Bologna—I’m confident you will LOVE it. You certainly won’t be able to see and eat everything in two days, but it’s better than nothing. I spent a few days in Bologna last year and loved the slow pace and beauty of the place. I’d spend my days eating, wandering, or writing at a cafe in a piazza and it was a perfect way to end my trip. Your Couchsurfing experience sounds awesome, though. I think I’m going to try Couchsurfing more when I’m in Italy this spring to try to connect more with the culture. I mean, you really can’t beat making ragu with an Italian! I think one of the things we struggled with in Europe in general is that we were moving so fast that we weren’t really able to soak in the places we were visiting and feel like we understood them to the same degree we did in Asia, so when we did get to CouchSurf and stay with locals, that really made a huge difference to us and tended to make those destinations really pop for us. We feel so lucky that our hosts in Italy were so wonderful and really helped show us the heart of their homes… once more, the people are the places and they always wind up being the thing that can make or break a destination for us. Couchsurfing has never failed us And in fact, it was always a different, but very good experience. I am filing all of these posts away for our future reference. Right now we have narrowed it down to two destinations for the spring — Cuba or Italy…I know wildly different, but we have good reasons to visit both! Yes, we never had a bad CouchSurfing experience either and cannot recommend it highly enough. We didn’t Surf as much as we could have, but we have no regrets and treasure every friendship we made, which is certainly the best you can hope from from this type of activity. I know I’m biased but… if it were up to us, we’d totally go to Cuba. Italy had it’s charms and depending on when you go, it may be less overrun, but I think Cuba will only get more popular in the years to come where as Italy is already passed its tipping point. Hm, good point on Cuba. A bit like Myanmar I suppose. So far everyone we talked to has been voting in favor of Cuba! and it will be so warm (I type this as it’s snowing outside of my window here in Washington DC). So glad you didn’t pass up Bologna (I would choose it over Venice any day – Venice is nice and all, but the crowds and overpriced touristy-ness of it drives me insane!) I still dream about the most magnificent melanzane parmigana I had in Bologna and have never been able to replicate since. And the Prosecco and the tortellini and the ragu and the gelato….I could go on haha! 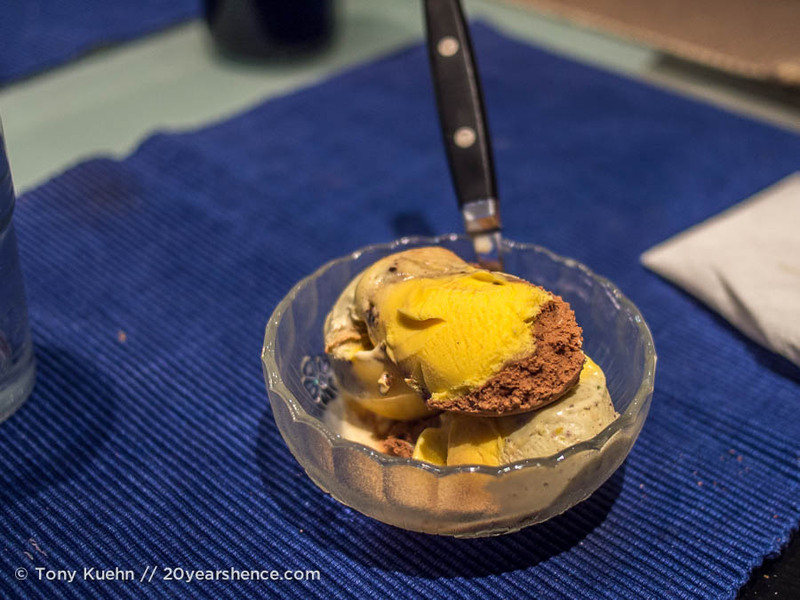 The food really is spectacular in Bologna, and we only tasted a small fraction of what is on offer. I am sure we will make it to Venice some day, but I suspect it will never be our favorite place in Italy… we tend to adore places like Bologna far too much, and Venice seems its very opposite! It sounds like you feel the same way about Bologna as I do about their little neighbor, Modena–best of the cities I visited in Italy! They even look very similar. The more we read of others experiences the more we think the biggest mistake we made in Italy was spending so much time in the famous cities. For us, it was the little tucked out of the way places that were really fantastic. Next time we visit, we’ll definitely have to visit Modena! I’m so glad you had a great experience in Bologna which is one of my favourite cities in Italy, in fact every time we can, we stop by even if for a few days. I’m absolutely in love with Bologna’s portici. Yes, Bologna definitely delivered the Italy we were hoping to experience on our visit and I’m so glad we wound up visiting. Truly Enrico’s hospitality is what sealed the deal and really made our visit so special, and next time we visit Italy we will have to try to do some more CouchSurfing so we can form that local connection we love so much. I think you made a wise choice – even though it was over a decade ago, we went to Venice in freaking July. Not smart. At all. I would’ve much preferred to have a nice intimate tour and time like you guys did! I’ve heard that Venice gets pretty swampy in the summer, so I can only imagine what hell that must have been (not even taking the crazy crowds into account). I know we’ll eventually head to Venice one day, but I suspect we’re the kind of travelers for whom the overlooked places will always be our favorites. At last! I’m so pleased that you finally found a piece of Italy that really showed you and shared the Italian experience. I was worried that you’d go away with disliking Italy and all that it stands for. I’m British but Italy is one of those countries that I could possibly see myself retiring to. At least, my German husband would LOL! I haven’t been to Bologna but I’ve been to Italy perhaps 10 times or so, and I have my favourites. The lat time that I was there, the owner of our villa told us about about an Italian butcher in Chianti who opened his kitchen once a month and made piles and piles of food. We happened to be in the area and managed to get a normally-sold-out-in-a-year place. It was in a small village called Panzano, most people were Italian or personal friends of the chef from Brazil, and during this time, the “normal” resturant was closed to the general public. It was a very, very long table of about 40 people, and there was no menu, piles of food were put in front of you and you shared with complete strangers. All in Italian.We managed to have a chat with the chef and when he found out I was from England he got pretty excited and kept talking about “my friend Oliver” which was the only English he seemed to know. Imagine my surprise when I later googled him to discover that “his friend” was actually Jamie Oliver and that this “local” butcher was a world-reknown Italian chef. His name was Dario Cecchini. Victoria@ The British Berliner recently posted..It’s bizarre. It’s quirky. It’s THE WYLD! Bologna definitely helped make up for the rocky experiences we had in Florence & Rome and was a good reminder for us about what kind of travelers we are and what it is that we find ultimately rewarding in the places we visit. It also didn’t hurt that the food here was FINALLY as good as we had expected, that’s for sure! Definitely make sure to include it on your future Italy itinerary! Considering that spaghetti Bolognese is my absolute favorite dish of all time, I would be remiss not to visit this charming little town! 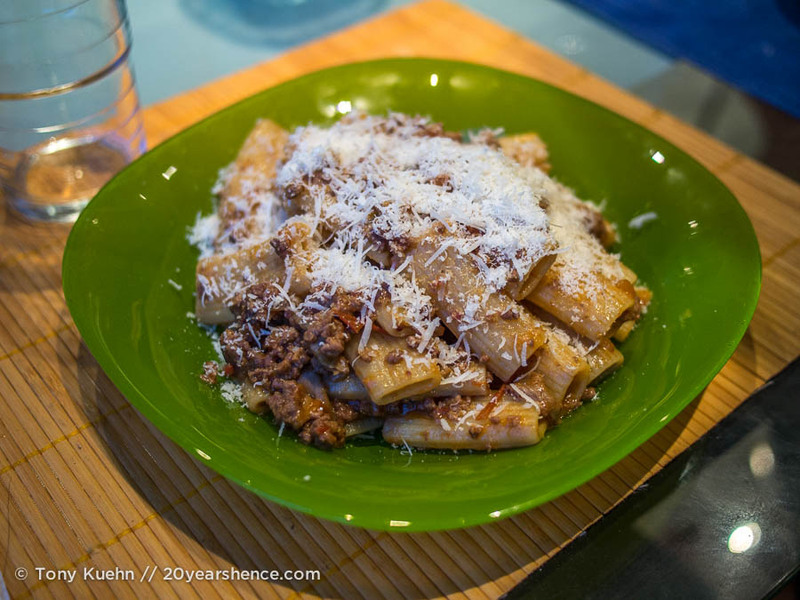 I just made an authentic Bolognese sauce the other night for dinner and it brought back so many good memories! It’s not at all like the sauce I grew up eating and making, but so good. I will be very interested to hear how you think it compares to the versions you’ve tried before! My wife & I visited Bologna in spring 2014. First stop in our 2-week vacation in Italy & we absolutely loved this city. The sights, sounds & tastes were as inviting & satisfying as any other Italian location we visited – we enjoyed the lower traffic (pedestrian & vehicle) compared to larger metro areas in the country. 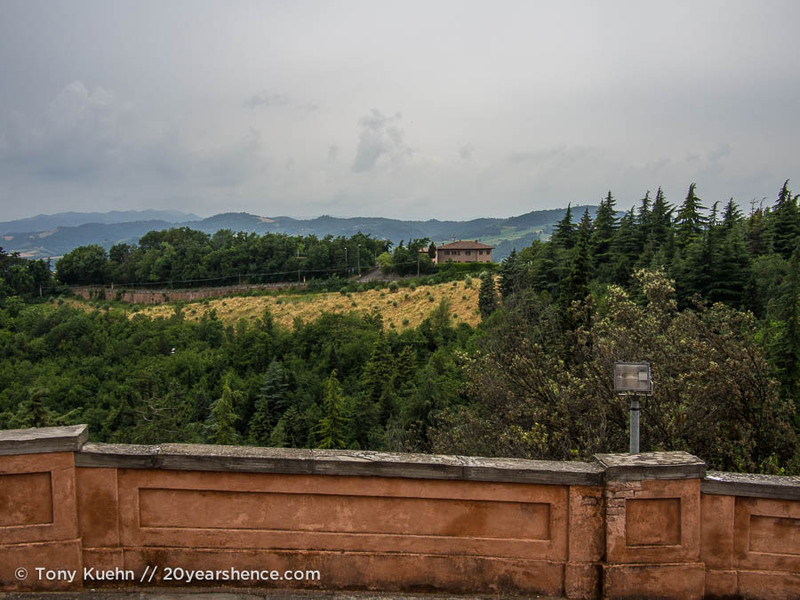 I enjoyed an arduous run through the porticos up to San Luca on a warm, humid day but rewarded with the spectacular view (as shown in your photos). We loved the many towers, cafes &, of course, porticos! Though slightly less touristy than Rome, Florence & Venice, we would happily go back to Bologna for a longer visit & highly recommend it.